← Red wine in a glass – What should it look like? A varied and interesting selection of dry, off-dry and fruity rosé wines will be offered for tasting at Die Bergkelder in Stellenbosch on Thursday, February 2, presented by red-wine maker Justin Corrans. The line-up of wines includes the latest vintages from Le Bonheur, (made from Pinot Noir), Durbanville Hills (Merlot), Nederburg (Cabernet Sauvignon), Two Oceans (Shiraz), as well as rosés sold under the Flat Roof Manor, Hill&Dale, Theuniskraal and Graça labels. A light supper will be served after the tasting. 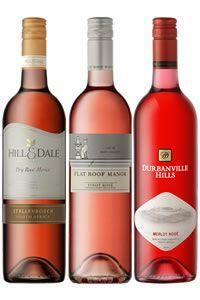 One lucky guest will take home a selection of six of the wines tasted in a sales-slip lucky draw. Die Bergkelder tastings take place on the first Thursday of every month and feature a selection of premium wines, brandies and whiskies. Whatever you buy on the evening will be available to you at a 10% discount, so think about stocking up on Valentine’s Day gifts too! Cost: R60 per person and includes the wine tasting and light supper. Booking: Places are limited so booking is essential. Contact Melanie on 021 809 8025 to reserve your seat.